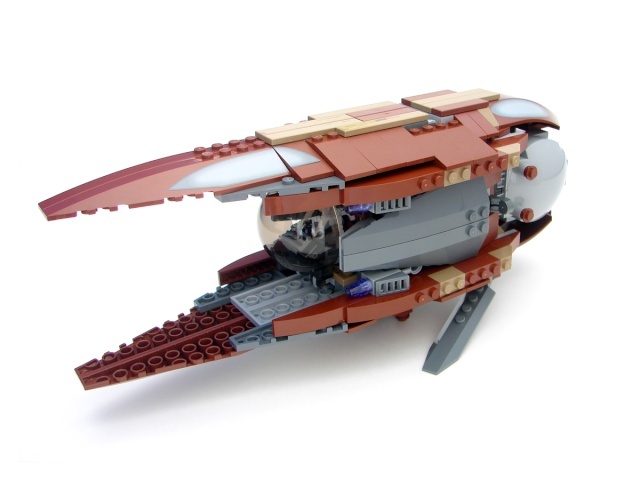 I have written a review of 7752 Count Dooku's Solar Sailer on Brothers Brick. Hope you guys find it useful. Finally! I've been waiting for one of these. Are you kidding me? $60 for this set? Not to mention that the solar sailer isn't really the best ship Lego has made and not really that big in size either. I will pass on this one. At first, I thought this set would cost maybe $30 if I was lucky, $40 max. But I guess I'm wrong again...by a lot. This is a worse deal than Ahsoka's Starfighter set, mainly because Ahsoka's fighter looks better IMO. But anyways, it's a really nice review, and the first I have read of this set. It's not a bad set, but I think the price is enough to turn down those who are not die-hard fans of Star Wars legos. 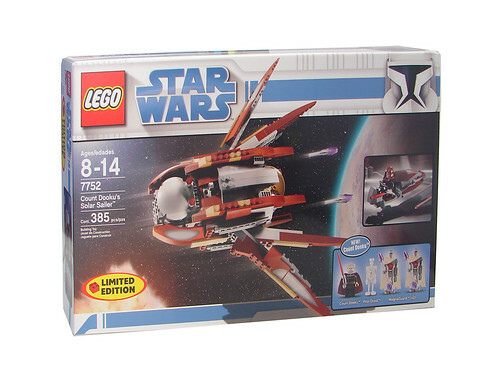 I am quite disappointed because I really thought this would cost less than the Magnaguard fighter, so I could get those Magnaguard minifigs without paying as much, so I guess my best chance is to buy that Magnaguard starfighter, but I don't even like that ship. I'm not so sure now. $60? Not sure about this. And the fact that it is hard to display. Also, the Count's hair looks pretty awful. If I do get this, he may keep his hood on all the time. Best review I have read before. You covered more then I could have ever thought of talking about. I think you got everything. Why can't Lego use the 'real' and better looking pose for the box art? It might help it sell better too. Yes; spread out it looks fat, stumpy, and ungainly, but in that pose it actually looks close to a Geonosian Fighter. In the spread wing mode, the ship appears larger, if LEGO were to show the other version, then it'd look like a $30 set. So the best part about this set is the Dooku minifig? It doesn't even look like him. It looks more like the disgruntled love-child of Christopher Walken and Gary Bucy! um yes it is. did you read it? Also I just picked one up at my local Toysrus. unless you thought I meant it was on "SALE" . I meant it was being sold there. Although it dosen't have many pieces, this set is larger than the bad press it has been getting, same with the Hyena Droid Bomber. Im not trying to make you change your mind but this really is a large set, fans just decide they don't like it, oh and its 28cm long, and everyone seems to say things nowadays about a set being too small so they won't buy it, well: first you need to see it in front of you and YOU be the judge. Vamprah, I understand what you mean. It's true that Legos look better in real life than they do in pictures, and I understand that, but I still think this is just a way for TLC to get some extra money. 28 cm is barely less than a foot long, which makes this ship a somewhat decent size, but I would say not for the price. $60 will get me a hmm....Republic Attack Shuttle or a V-19 and to me, this set just doesn't look like it's the equivalent of any of the other 2 CW sets. I understand that some of you really like this set. I would too, if not for the price. What I am considering is if the set is really worth the value. Sure, there's a new dooku fig, but I can't say that it looks awesome. There are also the nice magnaguards, but I can get that in a cheaper set. I also can't say that the solar sailer itself is a dazzling piece of machinery. Nowadays, I favor ships that are aesthetically pleasing, and unfortunately this one isn't quite it. In terms of playability, it doesn't looks better than that of the V-19 or Republic Attack Shuttle. I am very much satisfied with my V-19 and I hope to get the shuttle sometime soon. So anyways, yes I may be just that I am "judging a book by its cover" and of course this set has the potential, but I will pass anyways. Now if you put one in front of me, of course I will say it is a nice set (to me, all new sets seem nice) but when you tell me the price, I will immediately say no. There's just a difference between an overpriced set and an overpriced set that is a "must have" and looks nice (The sets I am thinking about right now is Ahsoka's Starfighter, AAT, and Separatist Spider Droid). All have low piece count than normal (none as low as this solar sailer) but they are kinda like the "must haves" based on either good looks, or good minifigs, or importance to movies (i dont watch the CW cartoon show, so I don't know whether this sailer is important or not), etc. Alright, I'm going to add a review. I picked this up at my local TRU last week. I didn't add pictures since I think that's been covered. I'm more of a SW enthusiast than a LEGO enthusiast (and am not good at MOCing), so I don't get too excited about parts. There isn't anything too special in the parts. A lot of brown, long sloped parts. Quite a few stickers too. The build was very straightforward and quick. I mistakenly received two dark gray 1x2 "male hinge" pieces instead of two light gray ones. Luckily, they went on the bottom and don't really show. Surprisingly good. The pilot droid is nothing special. Just standard-shaped white droid legs, torso, and arms, with a skeleton leg as a head. Still, he (it) serves the trick. Getting two Magnaguards is great, since the only other set they're in is the Magnaguard starfighter which isn't that great looking IMO. The first fleshie Dooku! He doesn't look all that bad, and actually looks better in person than in pictures. The hairpiece is kind of stupid, but I've just kept his hood on him. Makes him more myserious and Sith-like. Curved chrome 'saber hilt. Obviously this was modeled after the Clone Wars cartoon, not AoTC. It looks pretty close to what's in the cartoon. No sail like we saw in AoTC, but, again, we haven't seen a sail in the CW. The interior basically has nothing in it, except for a small "steering bar" in the front. Most of the space is used to store Dooku's speeder though. Also, the pictures are misleading when the front "points" are spread out. I expected them to fold both up/down and out/in. The only fold up/down. This doesn't much matter to me, since I just display LEGO sets; I don't really play with them. Just wanted to point this out though. Good sized, but still very swooshable. As you know, the "points" can be folded in or somewhat (see above) spread out. Dooku can ride his little speeder, which has a clip for his lightsaber. Also, he can wear either his hair or his brown hood. Magnaguards a a nice addition. The missles fire nicely. When I had finished building it, I tested them out by shooting my wife while she read a book. 15.5 cents (US) per piece. Nothing else to say. But, everyone can clearly see the price and piece count before buying. These are starting to pop up at TRUs. (It's a TRU/S@H exclusive). To be fair, it's only January and this was given a February release date. This was our first chance to get a fleshie Dooku, and I actually like his head better than just using the same Obi-Wan face. The set is an adequate as both a display piece and a toy. If the price:parts turns you off that much, then don't get this set. Overall, a nice set, but not one of the best LEGO has made.